Professor Martinez received his J.D. from Columbia University School of Law in New York City and his B.A. from Occidental College in Los Angeles. He has extensive experience in litigation, transactional work, and scholarship spanning over thirty years in a variety of areas of law and public administration. These include: environmental law, civil rights, government tort liability and immunity, public contracts, zoning, public schools, eminent domain, inverse condemnation, public borrowing and taxation, public budget controls and fiscal administration, special assessments, public personnel issues, and writs of mandate and related proceedings. 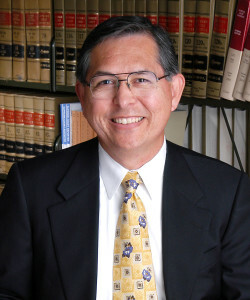 He is a litigation consultant in his fields of expertise in both state and federal courts. His scholarly work includes numerous articles and book reviews in property and municipal law, including: Local Government Law (Thomson-Reuters/West, 2d ed. 2012);Concise introduction to property law (with David L. Callies, J. Gordon Hylton, and Daniel R. Mandelker) (LexisNexis, 2011); Government Takings (Thomson-Reuters/West, 2006); and State & Local Government Law (LexisNexis, 2000). Before he retired from teaching in 2015, Professor Martinez taught property law, land use regulation, real estate transactions, constitutional takings, and state and local government law. In 2007 he received the Peter W. Billings Excellence in Teaching Award. Since retiring, Professor Martinez is traveling around the world with his wife Karen. After their travels, they plan to settle into one of their condos on the island of Kauai. He continues to work on his Local Government Law and Government Takingstreatises and will also publish scholarly articles from time to time.